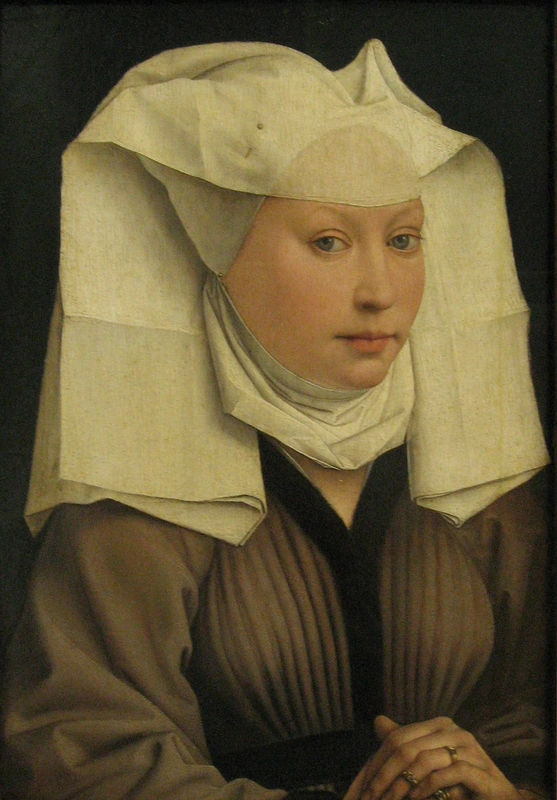 The Monforte Altarpiece is Hugo van der Goes' most celebrated work from his early career. Named after the town in which it was housed the Monforte Altarpiece could originally be found in a college that was home to a group of Spanish Jesuits. Like the Portinari Altarpiece, the Monforte triptych was created on a large scale and today only the vast, horizontal central panel, featuring the theme of the adoration of the Magi, remains. The two wings from this work have been lost and a group of flying angels has also been cut away from the top panel. 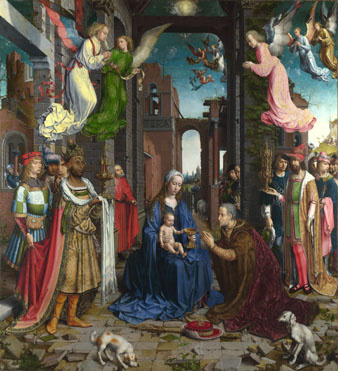 Looking closely at the composition the Monforte Altarpiece depicts the Virgin, the baby Jesus and Joseph in the ruins of a Palace and shows them being discovered by the Three Kings and their followers. A gathering of local people watch this rare scene through a gap in the wall. The figures are all painted to the same scale, irrespective of their status and each person reacts in their own way to the event unfolding before them. In the background a few more women can be seen as well as some cottages and a river, next to which the Kings' horses are positioned. In the foreground of the image, flowers and a pottery vessel are precisely captured. Above the villagers observing the scene a tiny squirrel runs along one of the beams. The Monforte Altarpiece is Hugo van der Goes's central work from his early period and it shows him unleashing his imagination with regards to both the triptych's composition and they way he uses color. The influence of preceding artists such as Jan Van Eyck and Rogier Van der Weyden is clear in the paintings' iconography; like Van Eyck, van der Goes' work is steeped in detailed realism and there is an epic construction of space. Furthermore, his figures are also unified in a natural environment of light and shade. However, Hugo van der Goes' personality and artistic style is still distinct, even in such an early altarpiece. As was characteristic of van der Goes' works at this time, he utilizes vibrant tones and mixes these with delicate shades to achieve the desired effect. Thus, he employed a warm palette and steered away from whites, silvers and gold in particular. The artist's early style was very different to that which he developed later on. In the Monforte Altarpiece the clothing adorning his figures is less decorative and does not serve to emphasize the forms of the body, the poses of the figures or their facial expressions, as he went on to do in later works such as the Portinari Altarpiece. Moreover, the artist did not adhere to mediaeval tradition whereby a figures' size was determined by their social or religious status - instead, he treated nearly all of his figures in the Monforte Altarpiece the same. Another depiction of this popular theme, influenced by Hugo van der Goes' version. Gossart drew most inspiration for this piece from Hugo van der Goes' Monforte Altarpiece. He was intrigued by the Flemish artist's views through ruined buildings to far-off landscapes and in his work he extended these views, particularly by opening up the centre of his image. The Monforte Altarpiece is a large-scale triptych which outshines the artist's other early paintings. 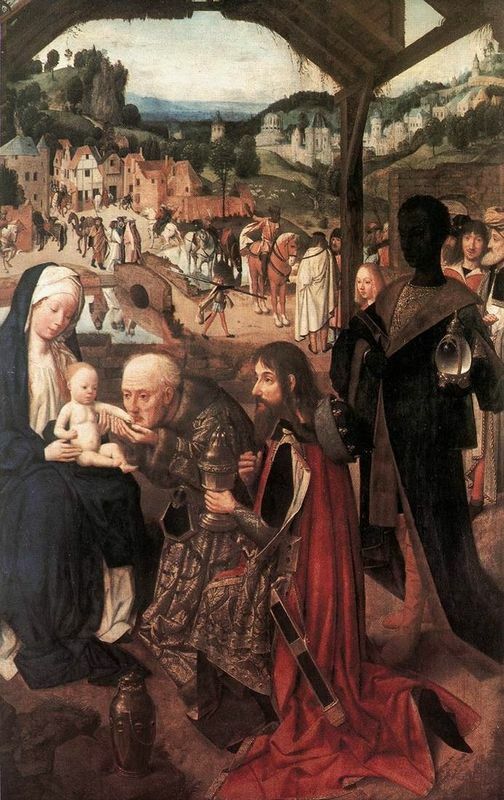 Based on the theme of the Adoration of the Magi, it demonstrates the artist's talent in creating paintings on a surprisingly large scale, both literally and in the unique size of his figures. 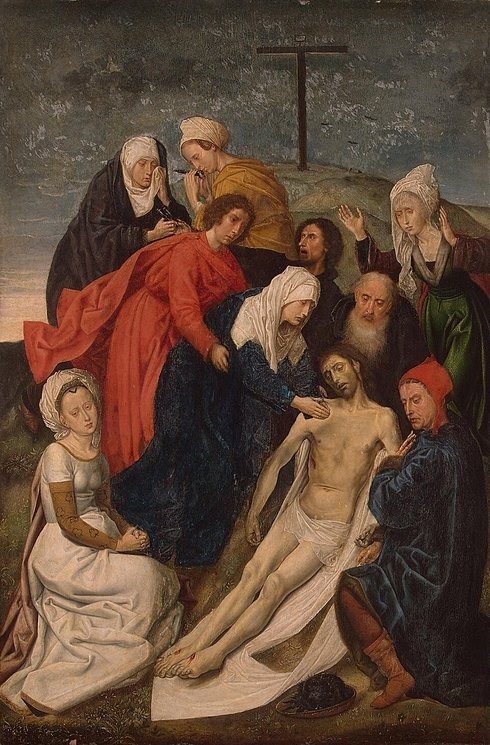 After Hugo van der Goes' death a vast number of drawings were left behind, and based either on these or his paintings themselves followers made countless copies of compositions and imitations that have not survived from van der Goes' own oeuvre. Many of these copies were created by easel painters and makers of illuminated books. Paintings from his first two periods, including the Monforte Altarpiece, were most favored. Thus, van der Goes' name has been mentioned in theoretical works and travelers' accounts throughout the ages and was not lost to posterity like so many Flemish artists.